In this edition of Random Thoughts from the Humidor, I ask for your input on future cigar reviews and lament house guests who don’t finish their cigars. What Cigars Should I Write About? I’m in a bit of a cigar funk these days. 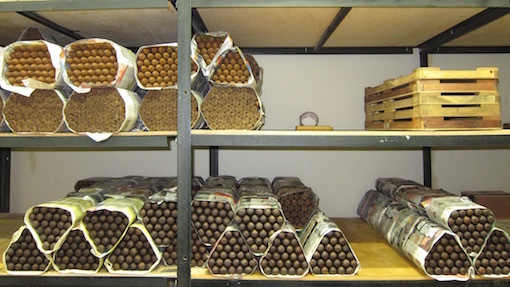 My stash is running lower than usual and, among the cigars that still reside in one of my five humidors, we’ve already written about pretty much all of them. So that begs the question: Should I buy a bunch of “new” cigars and focus on those (that’s pretty much what I have been doing since we founded this site in May 2006; I’m just falling behind lately)? Or should I start to revisit cigars we reviewed (in some cases) years ago to provide an update and an aging report? Perhaps the best strategy is a bit of both. But I figured I’d throw the question out to you, especially since the cigar blogger space is more cluttered than ever. What do you want to see reviewed? While you’re thinking on the subject, I’ve always wondered: Do you care about reviews of cigars that are no longer in production (I’ve got a ton of those on hand)? What about super-limited cigars, or exclusives? For example, take the cigars I receive each year as a member of Tatuaje’s Saints & Sinners club. The only way to get these cigars is to belong to the small, members-only club. Either you do, or you don’t. On one hand, I could see some people being interested in what’s out there, even if it’s unlikely they’ll ever get their hands on it. On the other, many people could consider the review a vain act of futility. What’s your take? These words written by my colleague nearly a decade ago still ring true, and I think they’re appropriate to recall as we think about reviews: “These days there are no shortages of cigar reviews online. Seems everyone has an opinion and wants to share. That’s not necessarily a bad thing. But before you read every cigar review out there and take each as gospel, let’s keep in mind what a review is… and, just as importantly, let’s keep in mind what a review isn’t. First off, a review can only be as good as the limited inputs that created it. That means whatever review you’re reading is first and foremost limited by two important factors: the reviewer, and the cigars sampled.” You can read the rest of this piece from 2010 here. Chances are, if you visit my home, you’ll be offered a cigar. My guests are almost never as into cigars as I am, and that’s perfectly fine. I am happy to share nonetheless and, despite my relatively depleted stash, almost certainly have a good cigar for the individual and timeframe in question. This is all well and good. What irks me, however, is when a guest will request (and receive) a top-notch cigar and then proceed to not even smoke half of it. If your time is short, or if you want a smaller smoke, please tell me in advance so I can help you select the best fit for your situation. I feel like this should be common courtesy. Aside from this pet peeve, let me know if you’re in the vicinity of Oak Park, Illinois, and want to stop by for a smoke and/or a bourbon. My front porch is a wonderful place to relax, and cigars are best enjoyed in good company–whether I’m writing about them or not. Your last point hits home. Pro tip; buy fake Cubans and keep them in a separate ‘open in case of douchebag’ humidor. The douchebag will never know the difference, and while they’re sitting there smashing that cigar into your ashtray at the halfway point because they don’t want it anymore, that vein in your forehead can take a break, knowing that your good smokes are going to good folks. I enjoy reading most reviews of cigars including rare and hard to find ones. I don’t find second reviews of particular cigars after aging helpful as I don’t invest in aging cigars. The thing that is most important to me when reading a review is whether I am familiar with the reviewer and if I find their tasting notes similar to mine. There are some very popular reviewers on the internet whose reviews I don’t find helpful when considering a cigar purchase because experience tells me that I have different taste preferences. Sorry you’re in a funk. I can relate. Taking a break from cigar smoking is something I do on occasion and time usually brings me back to a more enjoyable smoking experience. I enjoy reading about what’s out there even if I know I’ll never smoke it. Chalk it up to an obsession with the leaf, I guess. Can someone tell me why my favourite LFD Double Ligero’s can’t be found anywhere? They run out of tobacco or something?? Quality LFD Maduro and Oscuro wrappers are in short supply. Rather than push forward with production and pump out inferior cigars, LFD held all cigars using those wrappers from hitting the market. There were also issues of delayed shipments coming into the US due to logistical SNAFU’s, which has made the supply even more limited. This seems correct…and I can add to it. Problems remain with construction and issues shipping what dealers actually order. Always one of the difficult brands to deal with IMO. When you re-do a review of a previously reviewed cigar, can you know whether the cigar has changed, or could it just be your tastes have changed? And I like the idea of doing a combination of reviews of old and new. I second this, i think it would be interesting to focus on the far ends of the rating scale. Blends change over time so does manufacturing. (either a lounge or moderate temperature in the man cave or outdoors) I will always go with a known commodity. While I explore along my own path, usually going with preferred blenders (like EPC) or tobacco sources (Aganorsa)to lead me to newer brands. I do look to some review sites (including this one) that tend to have preferences that mirror mine to lead me to try brands outside of what I would normally try, and to that end, look to you to weigh heavier on the New cigar side. One approach I may suggest that you consider is to take a bit of an inventory of what you have been sampling lately and what has been missed, then look to fill some gaps. For example, you have done a thorough job with Cornelius and Anthony, but have only fully reviewed two Warped offerings (with high marks). Likewise have given your two Curivari reviews high grades, but not broadened your sampling of their other lines. Some other possible opportunities; RoMaCraft, Southern Draw, Warped/Casa Fernandez for example. This is great feedback. Thank you very much! Hello Patrick. You and your colleagues have been a trusted source of info on cigars since I got into this. I thus value your opinions as a way to sort through the myriad brands on offer. Also, I consider your 5-stick cigars my bucket list of great smokes. So yes, I would like to see you guys continue reviewing new smokes. You could use your Quick Smoke reviews to screen out the lesser ones, then move the good ones on to a full review. And yes, I like to also see the admittedly subjective reviews of aged cigars with bias towards those still available in order to help us put up some of our own. However, an occasional review of an aged great cigar no longer available is fun, giving us hope we may find one or two some day. My two cents: review whatever you are smoking, even if it’s older stuff. I like this blog because the cigars you choose to review are similar to the ones I smoke (ie not too many limited or special edition cigars). On a side note, I have been reading this blog for over 10 years and check it on a near daily basis. Keep up the great work and let me know if you’re ever in the DC area so we can meet up for a PG Cigar at Shelly’s! Patrick: I see you haven’t reviewed any FQ cigars. Phenom 3 was one of the first I smoked and is still a favorite. I haven’t had a chance to try Matt’s new one, but would be interested in what you guys think. I know my taste has changed quite a bit from the start and some I liked initially have fallen out of favor with me. I think it would be interesting to see articles where you revisit maybe two or three with a shorter review in the same article and a link to the original. I retired 3.5 years ago and took up smoking cigars. My son runs a cigar lounge and shop in the KC area and got me good and hooked on fine cigars. You can say I have a passion for this hobby and try to absorb all the information I can. Just the way I am when I get interested in something. I keep some decent, but less expensive sticks to offer those who are casual smokers, just in case. Usually, it’s ignorance that makes folks do what they, so I offer gentle instruction to share what knowledge I have. Maybe next time, a better smoke is in their future. Can’t really bring myself to give them a dog rocket in case I’m turning off a future cigar lover. Originally from Elgin area, but don’t get back very often. But if I do, your front porch sounds like a perfect place for a cigar and conversation. That’s really what it’s all about, isn’t it? Read all Stogie Guy’s articles and comment often to show my appreciation for the effort you all put into it.